Ghanta offer is a mix of night and day call package by Warid. This is valid only for prepaid customers and they can enjoy all time low rates on calling their heart ones. Switch onto this package after reading the below details with keen interest. You are given a time frame of 12am to 6pm after subscribing to this package. Cost will be Rs.3.99 per hour plus taxes and it will be applicable from the specified time. You will also be charged for a daily subscription fee of Rs.2 plus taxes. This offer will be automatically re-subscribed on next day if sufficient balance exists in your account. The calls from 6pm to 12am will be charged as per the original package. For subscribing to this package, SMS ‘GH’ to 3333. To unsubscribe, write ‘Ghanta off’ and send it to 3333. 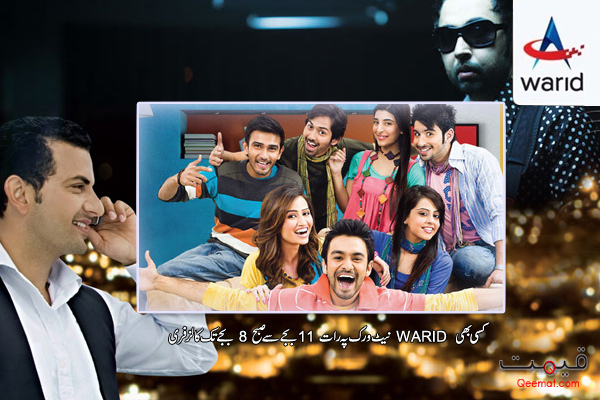 Make unlimited calls at Warid to Warid numbers from 12am to 7am. Send unlimited SMS to Warid numbers from 12am to 7am. The package also allows you to make international calls to Canada, UK and USA for Rs.1.5 plus tax per minute. Daily charges for subscription of this package are Rs.25 plus taxes. The activation charges for this package are Rs.10 plus taxes. The subscription method is very simple. Dial 321 and follow the instructions to activate this package. You can talk to any five FnF numbers free from 12am to 7am. With zem InfiNite Craze offer, you can also send unlimited SMS across Pakistan. The charges for this offer are Rs.10 plus tax per day. You can subscribe to this offer by dialing 321 and selecting InfiNite Craze. Charges for selecting FnF numbers are Rs.7 plus taxes per number. As the name specifies, this offer is available only for Karachi customers. This is perhaps a night call package for Warid customers of Karachi. The residents of Karachi can make unlimited free calls on all Warid numbers. Rates of attaining this offer are kept lower according to the needs and budget of customers. Find out the details of this package and have a great time using Warid. Customers can make unlimited calls to all Warid numbers from 12am to 12pm. Charges will be applied at the rate of 3.99 plus taxes per day. Call can only be made within the territory of Karachi to any other location in Pakistan. The offer will be automatically subscribed to your number if your balance meets the minimum requirement. To subscribe to this exciting offer, SMS “khi” or “Karachi” to 4337.
i m using warid sim and its call packages are of low rate.